2020 Census Will Ask White People More About Their Ethnicities The Census Bureau says people who mark "White" for their race will be asked to write in their origins in countries such as Ireland. Some white people say they're not sure how to answer that question. 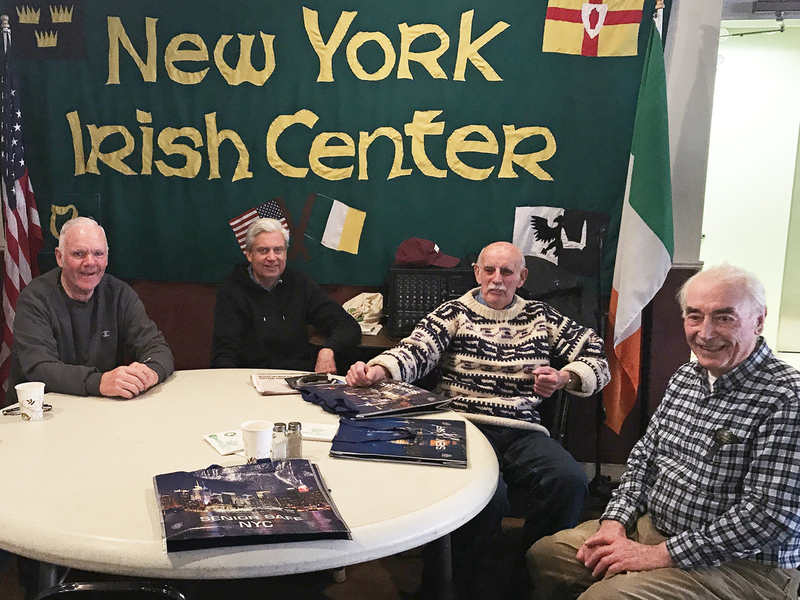 From left to right, Tommy Shiels, Dennis Hayden, John Houlihan and Thomas Ring attend the New York Irish Center's weekly luncheon for seniors in Queens, N.Y. Many attendees say they support the 2020 census asking white people about their origins. The race question is going to get complicated for many people who identify as white on the U.S. census. Since 1960, when U.S. residents were first allowed to self-report their race on the census, just answering "White" has been enough to complete the race question. But the federal government is now preparing to essentially ask non-Hispanic white people where they and their ancestors are from as part of the Census Bureau's inquiry into their racial identity. Last month, the Census Bureau announced it's adding a write-in area for the "White" category on the 2020 census questionnaire so that participants can provide their "origins." "Print, for example, German, Irish, English, Italian, Lebanese, Egyptian, etc.," read the instructions on the form the bureau is using in a practice run of the 2020 census in Rhode Island's Providence County beginning in March. Those suggested answers are among the largest U.S. population groups descending from Europe, the Middle East and North Africa — regions with "original peoples" classified by the U.S. government as "White," according to the federal standards for race and ethnicity data. The Census Bureau has not responded to NPR's questions about why this change is being made to the "White" category for 2020. A similar write-in area will be added under the "Black and African American" category. The bureau has conducted extensive research into how to collect more accurate data about race and ethnicity in 2020. The data play a critical role in drawing legislative districts, enforcing civil rights laws and analyzing health statistics. Researchers at the bureau have recommended adding check boxes for the largest ethnic groups and a write-in area for smaller groups under the racial categories in a proposal that would radically overhaul the race and ethnicity questions on the census. But that extensive change would have required the White House's Office of Management and Budget — which sets the standards on race and ethnicity data for the Census Bureau and other federal agencies — to approve an Obama-era proposal that census experts say the Trump administration is not likely to move forward. Nevertheless, in a report released last year, researchers at the Census Bureau wrote that it has been trying to address community concerns about the race and ethnicity questions, including a "call for more detailed, disaggregated data for our diverse American experiences as German, Mexican, Korean, Jamaican, and myriad other identities." For Cindy Spector of Brooklyn, N.Y., the new write-in area she'll be asked to complete after marking the "White" box in 2020 is raising questions about how well she knows her family tree. "According to my grandparents, we're Russian and Romanian," she says. But she's not sure where her great-grandparents and earlier ancestors were from. "They may have been from another country altogether," she adds. The census has asked all U.S. households about their origins previously. Recent questionnaires, including the one used in 2010, have asked all participants about ethnicity in terms of "Hispanic, Latino, or Spanish origin." But questions about ancestry have appeared on forms separately from the race question. Asking about origins in the context of race is a significant detail for Peter Farnsworth of Brooklyn, who says this change to the "White" category gets into personal territory. "Don't make me specify what kind of white," he says. "If you want to know my race, that's fine. But I don't need to give you details about what kind of white I identify with." Farnsworth says he identifies as "American," though his family has ties with England, Scotland, Ireland and Jamaica. "Nobody ever believes me when I say this," he adds, "but my dad's side of the family has lived in Jamaica for hundreds of years." Elizabeth Grasso, also from Brooklyn, says her ancestors came from Germany and Italy. "We came here from Sicily pretty recently," she explains, referring to her Italian grandparents, "but not me." Being asked to give a more detailed answer about her white identity, she adds, brings back stories she's heard about her immigrant grandparents. "There was discrimination against them when they were younger that ... I'm very lucky to not experience now," Grasso says. "But there was a time when Italians weren't considered white." At a recent luncheon for seniors at the New York Irish Center in Queens, N.Y., many said they support the 2020 census asking white people about their origins. "There would be no problem with that," said Thomas Ring of Queens, who plans to write "Irish" on his census form. "I don't think it makes a difference. We have all kinds of nationalities in the country." 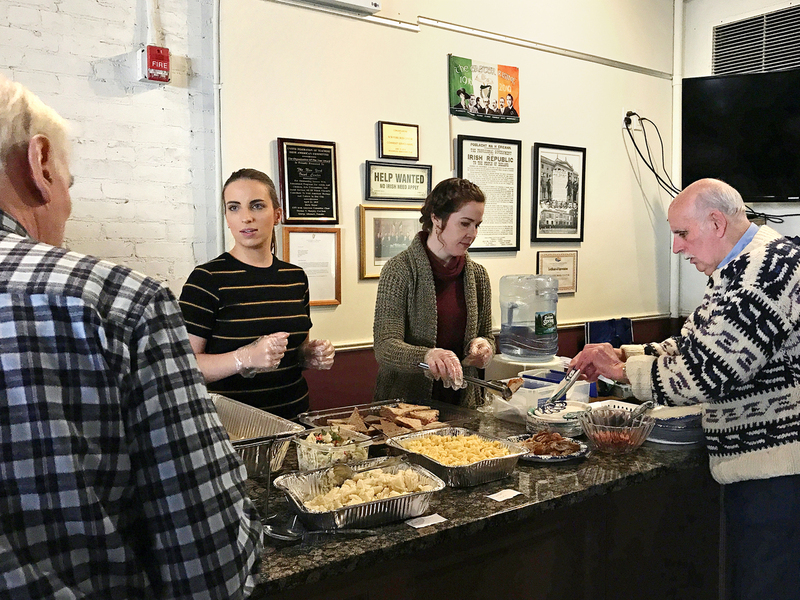 Erica Paul (left) and Danielle Gallagher serve lunch to John Houlihan and other seniors attending the New York Irish Center's Wednesday Lunch Club in Queens, N.Y. On a wall of historical memorabilia hanging behind them is an old sign saying "HELP WANTED, NO IRISH NEED APPLY." Fellow Queens resident Martina Molloy helped served slices of pizza to Ring and other seniors lined up in front of a wall of historical memorabilia, including an old sign saying "HELP WANTED, NO IRISH NEED APPLY." Molloy said she recently thought about how limiting the "White" box is when she recently filled out a form that asked for her race. "It's nice to be able to add something extra," she said. Born in Northern Ireland, she has lived in the U.S. longer than in her birth country. But she said with a laugh, "I always consider myself Irish first and American second, which may not be the right thing to say in this country but that's how I feel." Julia Clear, another Queens resident who attended the senior luncheon, is also planning to write "Irish" for her origins. Her late husband was of Italian descent, and she's worried their sons will have trouble fitting in both "Irish" and "Italian" in the write-in area. Still, she hopes the 2020 census responses will lead to a better count of people of Irish descent in the U.S., estimated to be at 32.7 million according to 2015 data from the Census Bureau's American Community Survey. "Is that accurate? Or is there a heck of a lot more of us out there?" Clear asked, wondering if the numbers from 2020 could show whether she's part of a shrinking population of Irish immigrants in the U.S.
"There are some people here that are in their 20s and 30s," she said, "but they're going to be the last bastions of people that are going to come in here and especially if the president wants to come along and just lock down the borders." But Charles Gallagher, a sociologist at La Salle University in Philadelphia who studies white identity, warns that any 2020 census numbers about white origins may not be reliable. "If you have a population that's been in the U.S. for a very long time and people have been, you know, crossing the ethnic line and dating and marrying," he says, "people aren't going to have a real accurate record." He adds that if you're thinking about mailing out your DNA for testing, beware: So far, the results are not a reliable guide, he says, for how to fill out your census form accurately.